Are Irish youth turning their backs on Europe? I've just read the Eurobarometer survey on Irish voting behaviour during the recent, second Lisbon Referendum (an update of a similar survey at the time of the first referendum). 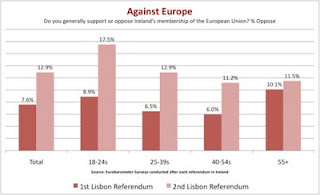 Two things struck me: the No vote was highest among 18-25s than any other age groups in both referenda; and opposition to Ireland's membership of the European Union increased in the same age group even as the percentage voting No fell. Of course we could dismiss this as 'youth sounding off' behaviour, and blithely assume they'll 'grow out of it'. I'm not so sure. 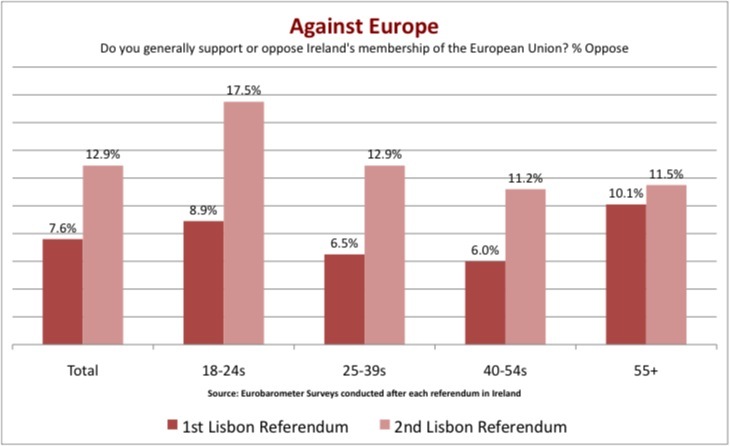 Firstly, as the chart shows, opposition to Ireland's membership of the EU increased in all age groups between the two referenda. Of course it's still a minority opinion (and not one that I share). But it isn't too difficult in these turbulent times to imagine one, two or more developments that might lead to a surge in opposition. Take the announcement by our newly unelected EU President Herman Van Rompuy that he supports the idea of a 'euro tax' to fun the Commission's expanding operations in Brussels. Try selling that to the mass unemployed youth of Europe (now experiencing an average 20% unemployment rate). And try selling it to Ireland's depressed taxpayers (they'd demand their Yes votes back). Still, at least we didn't get Tony Blair as president; I wouldn't be too keen on sending Irish soldiers off with their EU counterparts to invade countries containing imaginary weapons of mass destruction. Nevertheless, Van Rompuy's appointment sends a powerful signal that Europe has gone as far as it's going to go. The leaders of the main member states want to keep the balance of power between member nations and the European Union more or less as it is. To my mind this suggests that a period of circling stagnation lies ahead for Europe, a situtation hardly likely to assuage the concerns of Irish youth, and more likely to exacerbate them. Which is a pity. Europe faces a triple economic, demographic and democratic challenge in the years and decades ahead. The Van Rompuys of this world lack the political will to secure real changes that will benefit Europeans (e.g. : scrapping CAP, delivering a real Single Market); and they lack the imagination to inspire us with a vision of Europe's place in the emerging future (beyond the now moribund climate change agenda). Helping Africa join a world of free market democracies would be one such vision in my book. 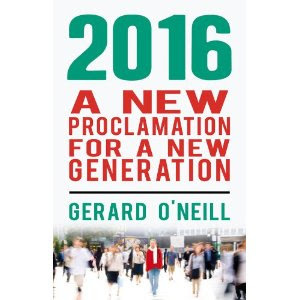 Ireland's youth will likely carry their less than enthusiastic feelings about Europe into middle-age and beyond. The job of any future referenda organisers is going to get a whole lot harder. Is it a bit early to pass judgement on Von Rompuy? I know very little about him. I read his quote about how Turkey could never be an EU member which I don't agree with. I think the EU may now go through a period of consolidation after years of Lisbon wrangling. I'll hold off on judging whether it is stagnating for a little while yet. And young people being anti-EU is alarming. So much more engagement with the EU is needed. Having more TV programs focused on EU issues would be a help. It maybe seem a minor point but I wish people would stop referring to this post as "President of the EU". It is President of the Council. "President" to us has an executive connotation but in French (which is what is relevant here) it is closer to "Chairman" i.e. any committee in France has a President (with an accent aigu). The fact that they went for someone like Von Rompuy is consistent with that: they want a chairman not a chief. I get confused myself sometimes: we now have three fixed term 'presidents' in the European Union: Van Rompuy (president of the European Council); Barosso (president of the European Commission); and Buzek (president of the European Parliament). But as the European Council is the highest political body in the EU then technically Van Rompuy is the highest political figurehead in the EU. So I understand the 'president of the EU' label. Maybe one good thing about his appointment will be to help a lot more people understand how the EU is actually structured? There is widespread ignorance of Europe among Irish people. We may go there for holidays or business trips, but most of us have never lived there, don't speak the language and don't know much about their politics and culture. If Herman von Rompuy were governor of California or mayor of London we would know about him.